Cherry Chocolate Chip Oatmeal Cookies – Voila! We are going vegetarian for the entire month of February! We’re still eating eggs and dairy, just no meat, including fish. I’m also using this month to try recipes I’ve bookmarked months (no, years) ago! It’s time. How will we feel? What will we think? Only time will tell. Each week we’re going to blog/vlog about the recipes, our thoughts and how our bodies are responding. Will we crave a hamburger? Will we even miss it? Stay tuned! 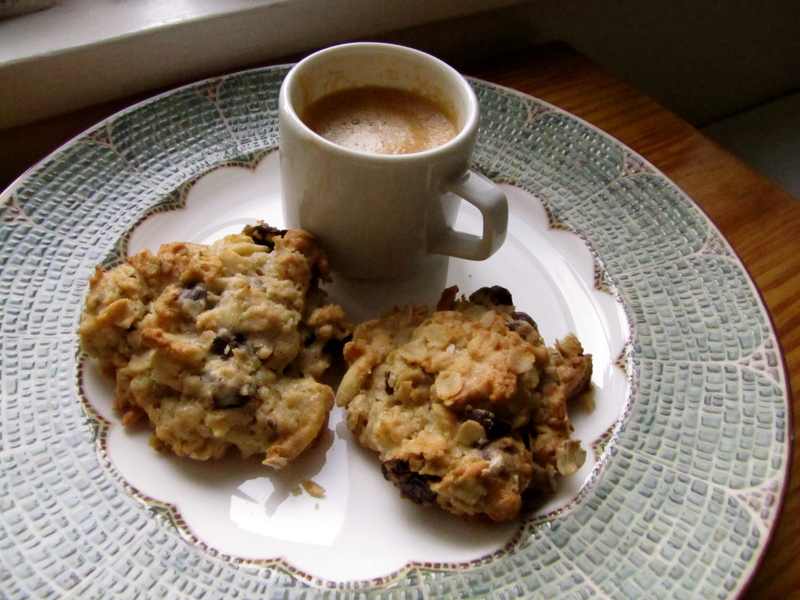 In the meantime….here is a recipe for delicious, chewy, action packed oatmeal cookies! 4. Working in generous 2 T. portions, spoon out cookie dough onto baking sheets. Place about 2 inches apart. 5. Place both baking sheets in the oven. Bake until cookie edges turn a golden brown, about 20 minutes, rotating baking sheets top to bottom halfway through. Serve with a cold glass of milk or Cherry Garcia Ice Cream!